See if you can follow this. This info c/o Search Engine Land. They report that Yahoo is going to be the default search on AT&T’s first Android handset, the Motorola Backflip. 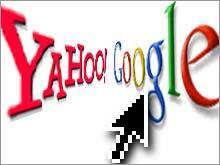 So you have an Android device, and Android is Google’s deal, with Yahoo search. Someone’s likely to get a terse memo on that. Also, T-Mobile has dumped Yahoo as default search on their portal, and replacing them with Google. My head hurts- does yours?